Reprographics is a broad based topic for students with the exciting opportunity to bring design and technology to life. 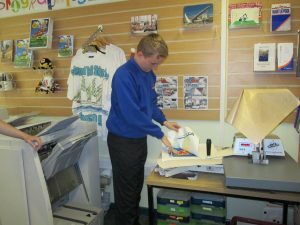 The department was created as a vocational option in May 2009 and now prints school stationery in addition to commercial work for paying customers. Students develop knowledge, skills and understanding of the graphics industry through the investigation of existing products leading to the design, development and manufacture of products of their own. They take part in practical tasks that give them the opportunity to develop and experience a range of techniques, skills and processes. Students develop skills for the world of work by being able to carry out routine tasks, follow instructions, complete tasks to a workplace standard and working safely.